We have a team of hardworking engineers that has valuable experience in website development and specializes in ReactJs. 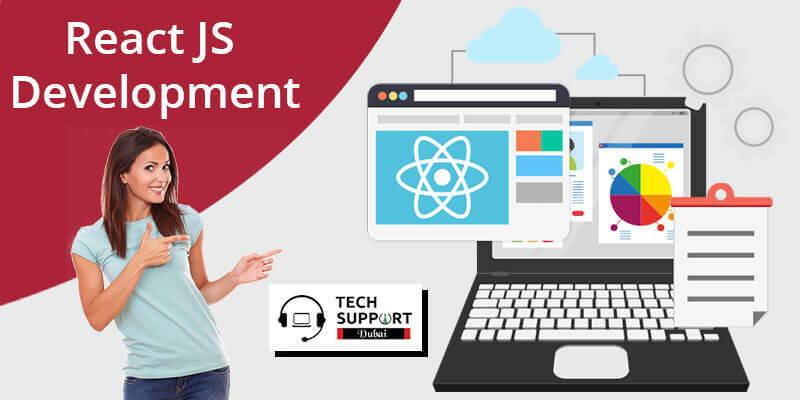 Our experts at Tech Support Dubai will help you develop dynamic web pages at pocket-friendly costs. Data Binding: Apart from one-way data binding, ReactJS uses an application architecture called Flux that controls all the components through one control point. Easy Debugging: ReactJS allows to debug components of large and complex apps without any hassle. Testability: ReactJS applications can be easily tested as you can manipulate the state of each component. You can also develop native mobile applications using React Native and avoid rewriting existing codes. This reduces your workload considerably. We can help you create single-page as well as mobile applications quickly. We will make sure that our services are in harmony with your long-term goals. Also, our professional team will help you develop scalable applications that attract the correct audience and boost your sales. Using React Native, we can power mobile apps and also render codes using Node. We are available round the clock with the most reliable services when it comes to ReactJS- based application development. Dial our helpline number: 042053349 and get in touch with our professionals for smart solutions in your budget. We have other means of communication as well. You can connect with us through the email or live chat facilities available on our website.